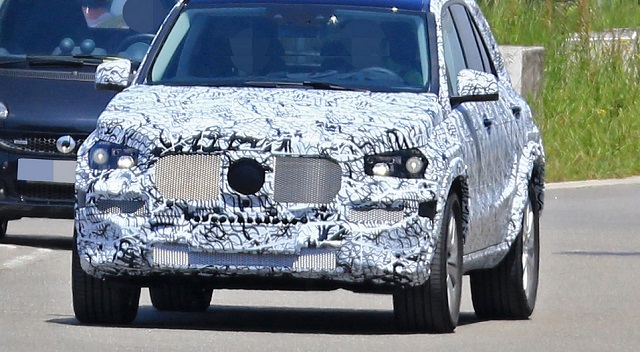 The prototype you see here is Mercedes’ new generation GLE crossover SUV. We know this because of the “W167” mark around back. So we are sure it’s not the rumored GLB, but the completely redesigned 2019 Mercedes-Benz GLE. From what we see here, the successor is definitely getting more interesting and quite rugged look. The actual details are not visible due the heavy camo, but the testing vehicle seems notably redesigned. This especially refers on the front end, which features a new grille and restyled bumper styling. We are also expecting the all-new headlights that should be pretty much the same as the GLC’s. 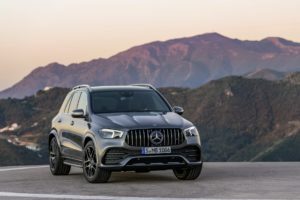 The 2019 Mercedes-Benz GLE sports wider and more pronounced wheel arches, and the roof looks to be lowered and more aggressive. The new bodywork of the interesting mid-size SUV seems to be inspired by the G-Class, so there will be no mistake with it. On the other hand, the interior styling should be quite alike to the recently introduced GLC crossover, so you can expect a classy look without any doubt. There will be a waterfall-style dash with its stand-up 7.0-inch infotainment screen and touchpad COMAND controller, while the MB-Tex faux leather should be the standard upholstery. 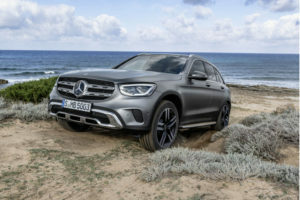 The GLE will be overloaded with a big number of features, so you can expect to see heated steering wheel, heated rear seats, radar cruise control, active parking system with steering assist, as well as a 360-degree parking camera. In addition to the GLC-based interior, the 2019 Mercedes GLE will also borrow the platform. It’s Mercedes’ MHA platform exploit plenty of aluminum, so there will be a dramatic decrease in weight for sure. Also, the vehicle gets shortened front and rear overhangs, yet a longer wheelbase, so you can expect more space inside. Under the hood, the 2019 Mercedes-Benz GLE will offer just the same options as the new-gen E-Class. This means you will be able to choose between a 2.0-liter turbocharged four-cylinder and a twin-turbocharged V-6. The GLE63 from AMG family will likely use a 4.0-liter V8 option, while you can also choose between a diesel and plug-in hybrid powertrains. A 9-speed automatic and all-wheel drive will be standard, so the driving should be easy and smooth. The 2019 Mercedes GLE will be one amazing SUV, which will arrive sometime in 2018. However, the carmaker will likely introduce the GLE coupe a year later, so the choice is yours.